Physiotherapy and balance retraining is an effective therapy to decrease and at times eliminate vertigo, dizziness, and balance disorders resulting from ear infections, medications, trauma, disease as well as aging. These concerns are listed as among the most frequent reason for trips to the doctor. Do you experience dizziness, light-headedness or feel like you are off-balance? Does the room feel like it’s spinning around you or do you feel like you are falling head over heels when you lay down to bed, lean over, or roll over in bed? You may have an inner ear dysfunction. Vertigo is the illusion of movement caused by involuntary eye movement. 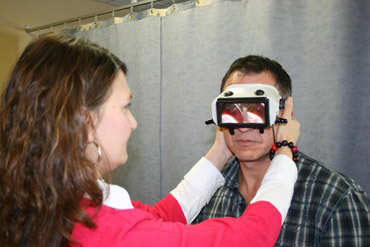 Our physiotherapist may use Frenzel goggles that magnify and illuminate your eyes to observe for this. If the vertigo is caused from BPPV (benign paroxysmal positional vertigo) the condition is often treated by a Canalith Repositioning Technique (CRT), often refered to as Epley’s Manoeuvre. The type of manoeuvre used depends on the type of BPPV a person has. This technique should not be attempted without proper diagnosis and instruction by your physiotherapist or physician. A qualified physiotherapist will also assess other functions of your vestibular system including the ability to maintain your focus while turning the head and for balance. 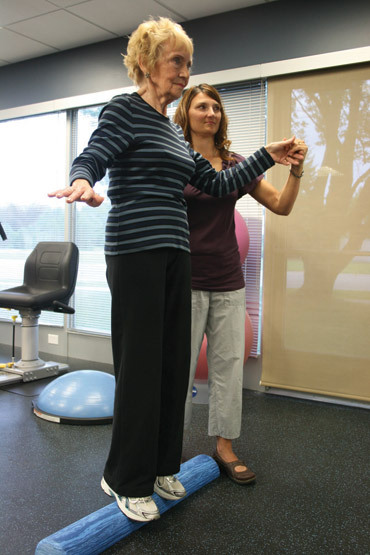 A customized program of in-clinic and home program exercises aims to resolve symptoms and restore normal inner ear function, thus reducing the risk for injury and falls. A qualified physiotherapist and occupational therapist will assess your strength, flexibility, postural control, endurance, balance and mobility. After the initial assessment and identifying risk factors, a customized program will be developed. Treatment may be provided in a class atmosphere or directly one-on-one with your therapist. Education on fall prevention and hazard identification. “Nintendo Wii-habilitation” - our unique interactive program, fun while challenging. Exercises that challenge dynamic and static balance. A home-based internet video exercise program. Recommendations on walking and mobility aids. By filling out the form, you are providing express consent to receive communications from inMotion NETWORK. You may opt out at any time. Copyright (2018) inMotion NETWORK. All rights reserved.